This post was originally published on Patreon, a crowdfunding platform that allows supporters to pledge a monthly amount of their choosing (as little as $1) towards my work, in exchange for perks including an extra post each month... Like this one! If you want more like it, please consider becoming a patron. I have a confession to make: I really love makeup. I have a confession to make: I really love makeup, and I don’t plan to ever make a career out of it. I’ve often seen people, in an attempt to convince others of the merits of children’s interests, point out that the kid who loves video games might become a game designer; the teen who’s obsessed with Anime might become an author of graphic novels; the child who can’t get enough of baseball stats could become a professional athlete… All of these arguments seem to be based on the underlying idea that each of these passions are worthless on their own, but gain greater status in being seen as a step to something useful: a step towards a career. To be clear, I’m not trying to put down individuals for using these arguments: I’ve said similar myself at times. And if pointing out that interests can lead to financial gain in the future helps a parent relax about video game time, or mollifies a concerned grandparent, I’m certainly not going to say there’s anything wrong with that. But when that’s the go-to justification for “letting” children pursue their interests, I feel like we’re internalizing some harmful ideas about worth--the worth of our own and others’ interests, and by extension the worth of ourselves and others as people. 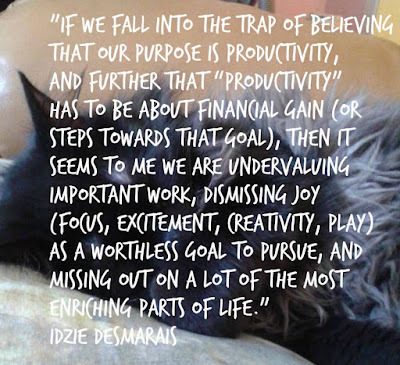 If you see your worth as being tied to your actions, to the way you spend your time, as is true for most of us, then if you think time spent doing some things is worth less, isn’t that going to affect the way you feel about yourself? And if you look at others and think “what a waste of time,” isn’t that going to affect how you think about and treat them? 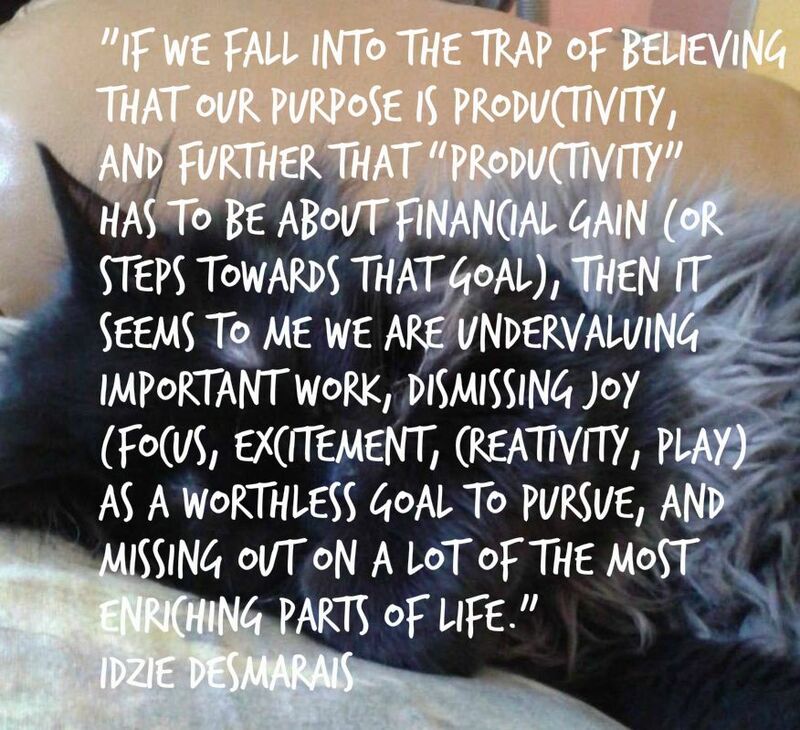 If we fall into the trap of believing that our purpose is productivity, and further that “productivity” has to be about financial gain (or steps towards that goal), then it seems to me we’re undervaluing important work, dismissing joy (focus, excitement, creativity, play) as a worthless goal to pursue, and missing out on a lot of the most enriching parts of life. Is money important? We live under capitalism, so of course it is (and we often need it to pursue the things we love most… Makeup isn’t free, after all). But we need to let children, especially, and also ourselves, explore all the parts of life we find ourselves drawn to, all the hobbies and interests that catch our eye, without needing to come up with a reason why we’re “allowed” to enjoy it. I don’t want to be a makeup artist. For me makeup is an important and exciting form of self-expression, something that makes me happy, allows me to be creative, and is a skill which I can greatly enjoy improving. What I get from it might not be as tangible as money, or recognition, or approval (though I’ve greatly enjoyed sharing this interest with others), but it’s important nonetheless. If it enriches your life, or the lives of your children, it has value. It might not be something that you’d choose--I fully respect your right not to wear lipstick--but we each find delight in different things, and that diversity is a good thing. Forget what an interest may or may not lead to in the future. Look instead at what joy it’s bringing, right now, right in front of you. That’s where the learning, and the fun, is happening.